What's missing from these trucks is the next level of opulence that comes standard on a swanky sedan that costs just as much. Of course, this vehicle doesn’t exist, at least not yet. Though American factories are stamping out increasingly opulent and expensive pickup trucks – some cracking the $80,000 mark – the creature comforts and tech-drenched amenities on these machines still fall years behind what buyers typically find on similarly priced luxury cars. 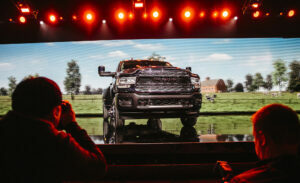 A 2019 Dodge Ram 3500 heavy duty pickup truck at the 2019 North American International Auto Show in Detroit in January. Bloomberg photo by Sean Proctor. The average price of a truck is now hovering at $50,000, in large part because of ultra-expensive models that fetch far more. To be fair, the price of a truck needs to cover a bunch of things the financial engineers in Stuttgart don’t have to worry about – massive engines, a lot more steel and aluminum, tie-down anchors, bumper steps and LED lights. “There’s a lot more capability and versatility on a truck, compared to a luxury sedan,” said GMC Vice President of Marketing Phil Brook. The cheapest version of Ford’s market-leading F-150 starts at around $28,000, though one in 10 F-150 buyers spent more than $60,000, according to data from Edmunds. Still, even with those caveats, the financial engineers have factored in plenty of cushion for these machines. Pickups remain the most profitable niche of the auto industry – up to $10,000 per vehicle – because of the wide gap between the price of the rigs and the cost of what goes in them. “I’ve started to wonder how much gravy there is in the pickup market going forward,” said Madison Gross, director of customer insights at CarGurus. GMC, meanwhile, is working on that little touchscreen. When asked if buyers can expect a higher gear of luxury on coming iterations, Brook, the brand’s marketing head, said: “It sounds like you’ve been at some of our product-planning meetings.” Most GMC customers can “buy anything they want,” he said, and a little more than one-third of them have recently been opting for the brand’s “Denali” treatment – its most expensive trim. The trucks, in short, will be getting even fancier – and fast. The only question is whether the price will tick up even more. There are no doubt plenty of people who would drop six figures on an F-150. Soon, they may get their chance.